Mobile Game Sound Design Archives - Somatone Interactive, Inc. The Churn is a destructive, cyclical force in the Vainglory universe. When it grows out of control, no human can live inside it. It kills or infects anyone who comes into contact with it. One enterprising explorer entered the Churn wearing an environmentally-sealed suit and charted this unknown world – but became a monster in the process. The Churnwalker is a horror straight from your nightmares. Early in his development, we decided that any words he spoke in-game would diminish his scariness. We thought about just having him make scary noises, but I grabbed the opportunity to construct a new language. The Churn language needed to be a workable language, because I wanted to use it in the Churnwalker’s written story, but also to be accessible in some way to our players. I began by choosing sounds and rhythms that sounded frightening to me, then decided on a conjugation structure. From there it was mostly a matter of following the verbs. I spent a few weeks muttering this creepy language to myself at my desk, freaking out the unfortunate people who sit near me at work. From the beginning, I wanted Roger Jackson for the role. I knew he’d take what I’d constructed and make it his own. I went into the recording with trepidation that quickly diminished when Roger entered the booth. My weird language rolled out of him as though he’d been speaking it forever! The Dehumaniser added a whole new layer of fun and inspiration to the process, allowing Roger to hear his voice transformed in real time. A series or trailers were created to tease the release of the much anticipated new character. In this one, you can hear the voice of the explorer become more and more corrupted by the “Churn” as the scene progresses. You can learn more about VainGlory at the publisher’s website, Super Evil Megacorp. Meet the Churnwalker, an explorer and cartographer who went too deep into a jungle, called the Churn, and became a monster. 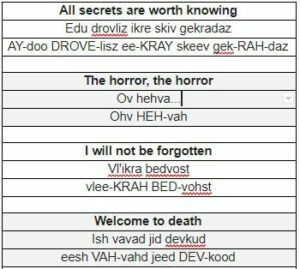 We’ve created a pure horror movie monster here: dragging chains, painful hook attacks, an alien monster look, and we’re topping it off with the creepiest voiceover we’ve ever attempted – in a brand new, constructed language. 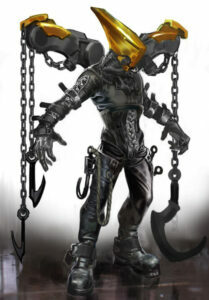 “All secrets are worth knowing” is the Churnwalker’s personal motto. Even if the secret can kill you, or make you into a monster. We recorded the vocal audio here at Somatone, in Emeryville, California. Sarah Arellano and Jason Osipa from SuperEvilMegeCorp, produced, Dale Crowley, of Somatone, directed, and Michael Brinkman, of Somatone, was the Recording Engineer. While Roger Jackson was in the booth, we ran the Krotos Dehumaniser2 plugin on an aux bus so that everyone in the studio, including the actor, could hear the effect the plugin was creating, and the actor could work with it in real-time. This gave Roger total control over the final product, by allowing him to play off of the effected voice, and create the sounds that he felt worked for this character. But in the end, what we had was a clean, raw version of his recording, that we could tweak, and play with, to bring out the Churn. 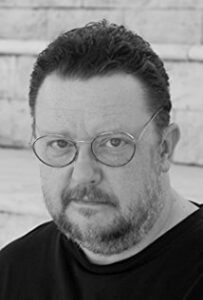 Roger created a character that fans are going to LOVE. In terms of playing VainGlory, it will be just as much fun to be killed by the Churnwalker, as it will be to BE the Churnwalker! Thanks to GREAT writing and character development, The Churnwalker is set to be one of the coolest characters in MOBA games today! 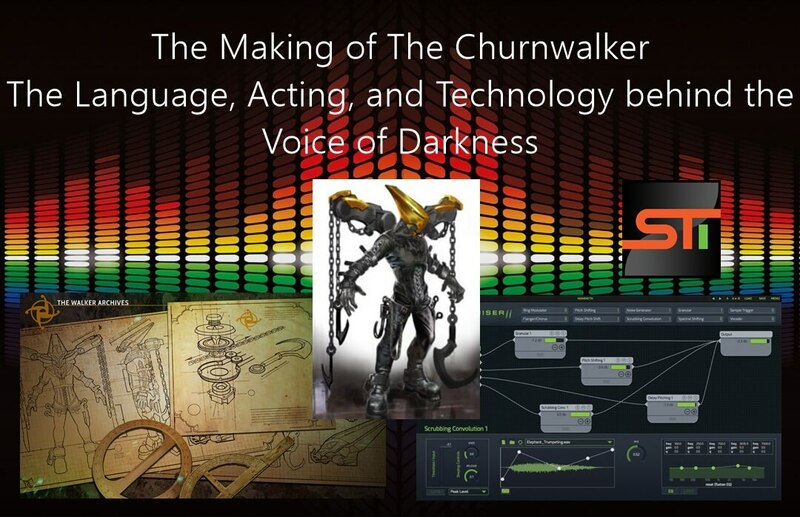 Michael Brinkman handled all of the vocal processing for the Churnwalker character at Somatone. 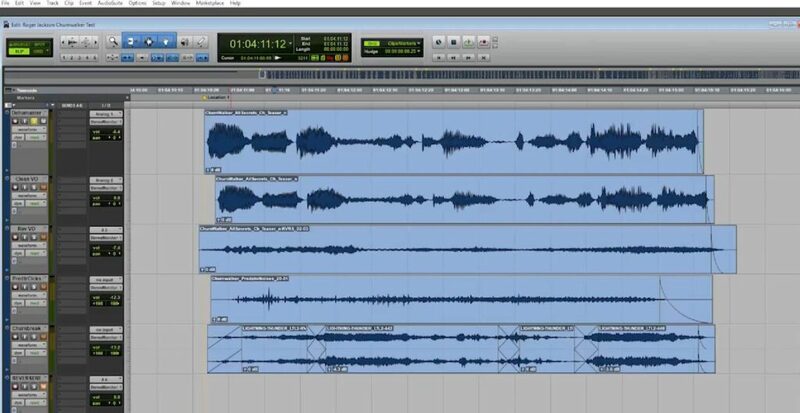 The project involved several layers of the same audio file being processed in different ways simultaneously. First, we started with the raw line of dialogue, then ran it through the Krotos Dehumaiser2 plugin, and came up with our own customized preset that included just 2 nodes. One for granular synthesis, and one for pitch shifting. This gave a really dark, sinister feeling to the voice, but also kept it clear and recognizable. Next, we took a copy of the same clean line of dialogue, and did a little modern day backmasking. First, reversing the audio with the standard reverse plugin in ProTools Audio Suite. 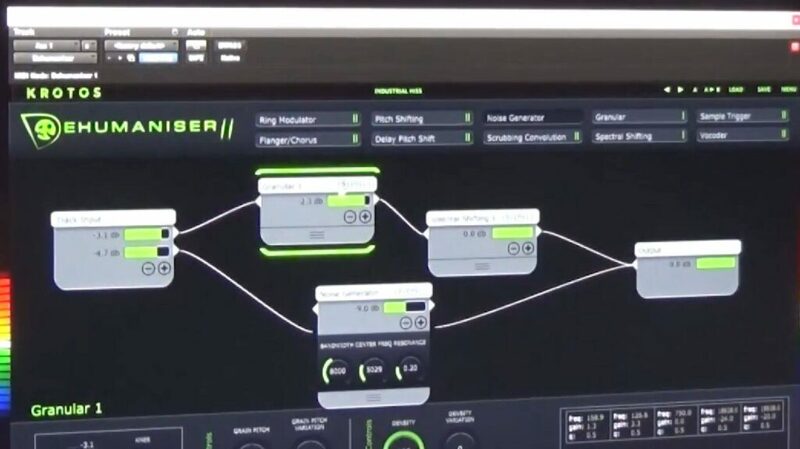 Then we added a decent amount of reverb with Truverb, and bounced that out as a new audio file. Once finished with the reverb, we again reversed the file using the same audio suite reverse plugin. The final product was a line of dialogue where each word begins in a reverb tail before developing into the word. This is a common effect in horror films for ghostly and/or evil characters. The third layer was something that Roger did on the fly in the vocal booth. We all decided we loved it, so we added it to the character. It was a sound similar to the chittering of the Predator from the movies. With a little reverb that included some glittery artifacts, we ended up with a nice effect that made you wonder what kind of mouth the Churnwalker is speaking with under that mask. The fourth and final layer of the Churnwalker’s voice, is the Churn itself. The tear in reality. The break in known existence that allows the Churnwalker to move freely among us. For this, we chose a set of samples of thunder that were really deeply rumbling, and sat mostly in the midrange, with a big notch in the area of the vocal EQ so the words were still clear, and understandable. Each line of dialogue for the Churnwalker had to be hand laid and edited with both the Predator clicks and the churn breaks, line by line. A process we believe was definitely worth it in the end. The resulting voice is one that fits the Churnwalker character in every way. The evil is well represented. The “not-of-this-realm” vibe is well represented. There is character in every line the Churnwalker delivers, whether he is taunting your character, killing your character, or dying himself. Roger Jackson and the rest of the crew made the Churnwalker one to remember. This will be a character you might want to only fight during the day… with the lights on. You’ve been warned. How many minutes of original music do you need? How many characters need to be voiced? How many total lines of voiceover? What audio engine are you using? Do you need sound for cutscenes or cinematics; if so, how many?